Kale Chips | Keep It Up, David! 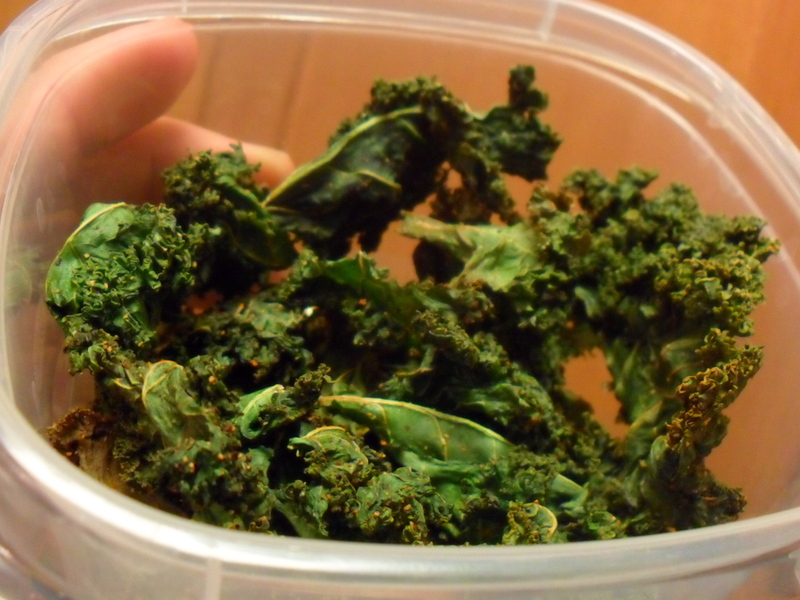 A couple of weeks ago, I wrote about my friend and office-mate Maggie bringing in some homemade kale chips. Maggie was inspired by watching Gwyneth Paltrow talk about them on The Ellen DeGeneres Show (watch the segment here; she also makes a vegan paella), and I, in turn, was inspired by Maggie. 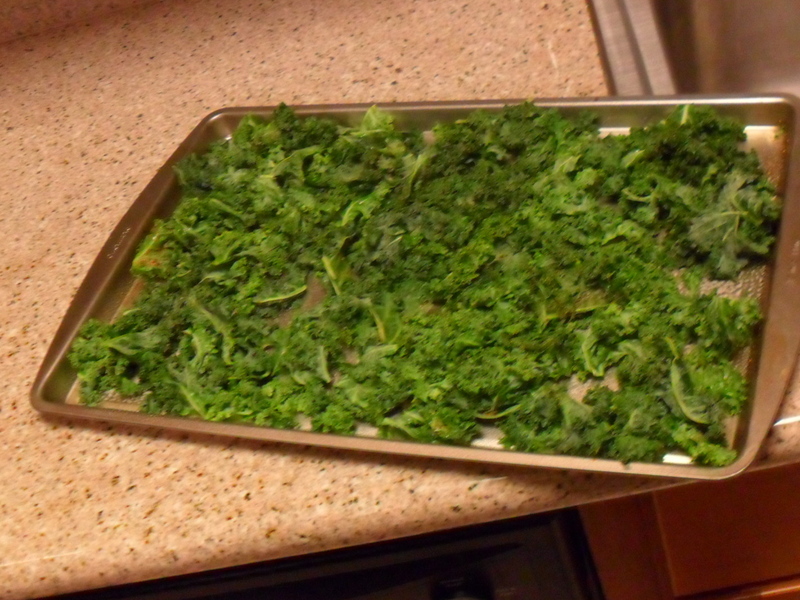 So I made kale chips a few days ago, and I documented the process with my handy-dandy camera. The first step? Buying kale. I recently bought kale for the very first time. See? 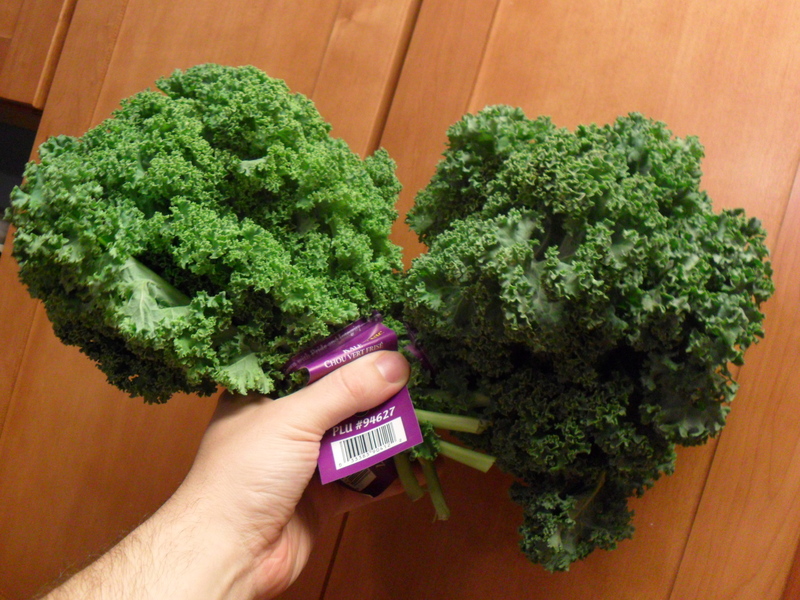 I was super excited to buy this kale, and I bought these two bunches knowing that they were destined to be turned into chips, and yet they sat in my fridge, untouched, but about a week. Kale is a hearty green, however, and so when the time came for the kale to meet its destiny, it was still in good shape. After depositing the stems in the trash, rip up the leaves into chip-sized pieces. No need to be scientific or exact – just rip big pieces in several smaller ones. 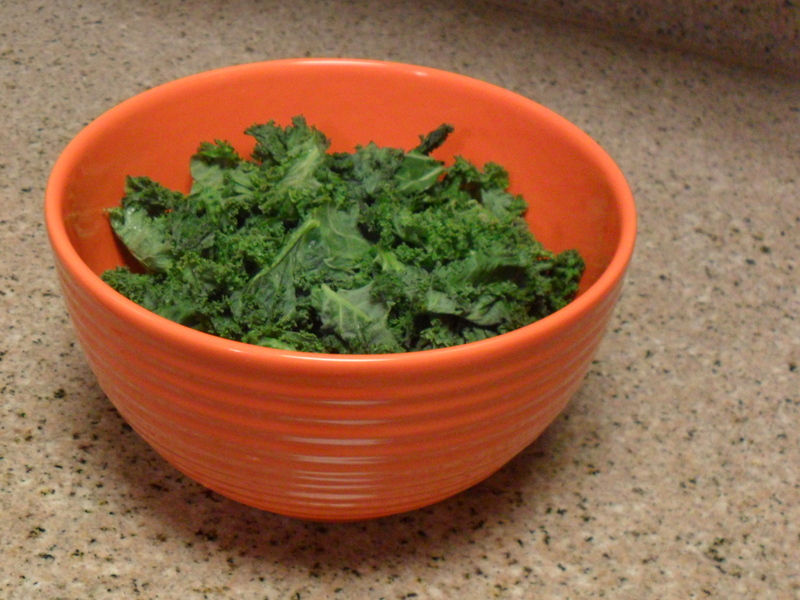 Then, you give the kale a good wash. My kale was kinda gritty – so I piled all my kale pieces into a colander, and rinsed it all under the faucet. If you have a salad spinner, use it! 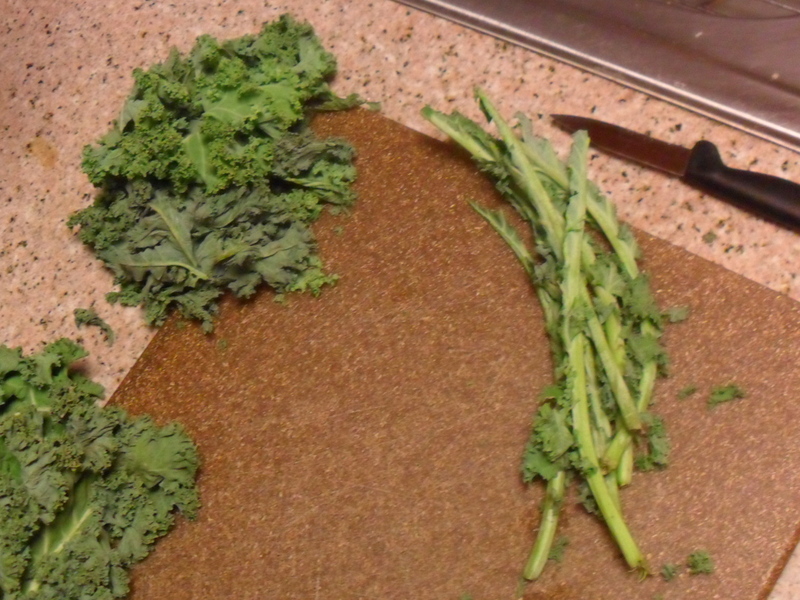 I don’t have one (and don’t want one, either – just another kitchen device that I don’t have room to store), so I got out a clean kitchen towel, and rolled the kale up, and gave it a good squeeze, and than seemed to work pretty well. Most kale chips recipes also call for salt, but I try to cut out salt wherever I can, so instead, I tossed in some Mrs. Dash (table blend) and cumin, because I love cumin and thought adding a little smokiness might be fun. Into the oven they go! 350 degrees, for 20-30 minutes. You want the kale to be crispy all the way through, but they’ll go from crispy to scorched quickly, so you gotta watch them near the end. I pulled out mine out after 25 minutes, and about half of them were perfect, and half of them were a little too brown. Not inedible, but not perfect, either. Those not-perfect ones, interestingly enough, taste really similarly to scorched microwave popcorn; whereas the good chips taste so much like potato chips, you can hardly believe it. They’re crispy, light, subtle, and delicious. That’s the finished product in a Tupperware-type container. I divided the chips between two of those containers, with the idea that I’d eat one over the course of the day, and take the other to share at the office the next day, but guess what happened? I ate both containers, completely, before bedtime. All gone. And they were good. And so guilt-free it’s ridiculous! Oh, and I haven’t mentioned that kale is a superfood – a great source in vitamins A & C, copper, manganese, calcium, and a bunch of compounds that may help prevent cancer. 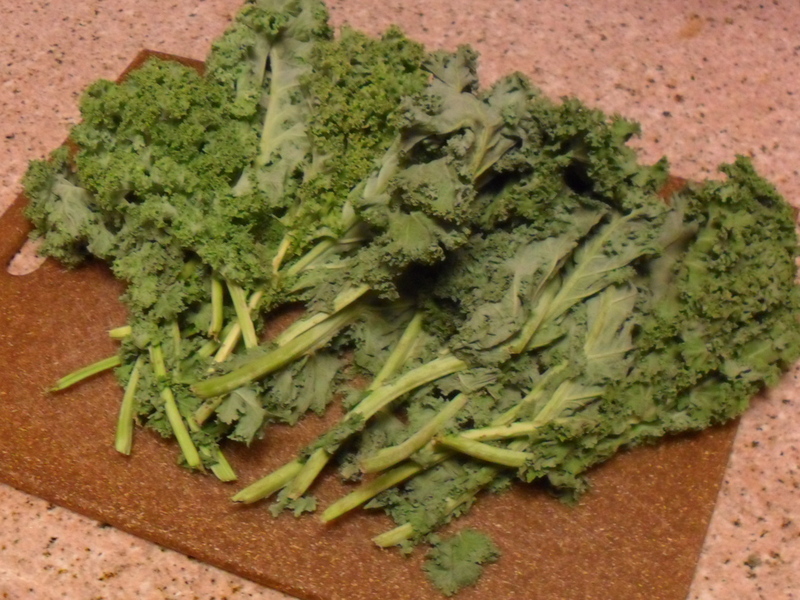 I’m going to keep making kale chips – are you gonna give them a try? This entry was posted on Tuesday, May 17th, 2011 at 1:06 am and is filed under Uncategorized. You can follow any responses to this entry through the RSS 2.0 feed. You can leave a response, or trackback from your own site. I have a horrible potato chip addiction, so I think I need to try these kale chips. I’ve heard about them all over the place, and the thought has always been, “Um, kale? Baked until crispy? Ew.” But, what have I got to lose (other than all the calories in the potato chips I would eat instead)? I had wanted to try these since you linked to the segment. So I made them about 2 weeks ago and (since you were so successful) I will now have to try again. I scorched most of mine, and added waaaay too much salt (when the kale dries up, there’s almost no mass to it, so a teeny tiny bit of salt goes a long way). Have you tried roasting/crisping thinly cut cauliflower this way? It doesn’t get as crunchy as kale, but it does have a nice crunch on the outer tips and I really enjoyed that recently too. Also very guilt-free! I’m gonna try it! Thanks for posting it. Okay, I’m gonna try it! 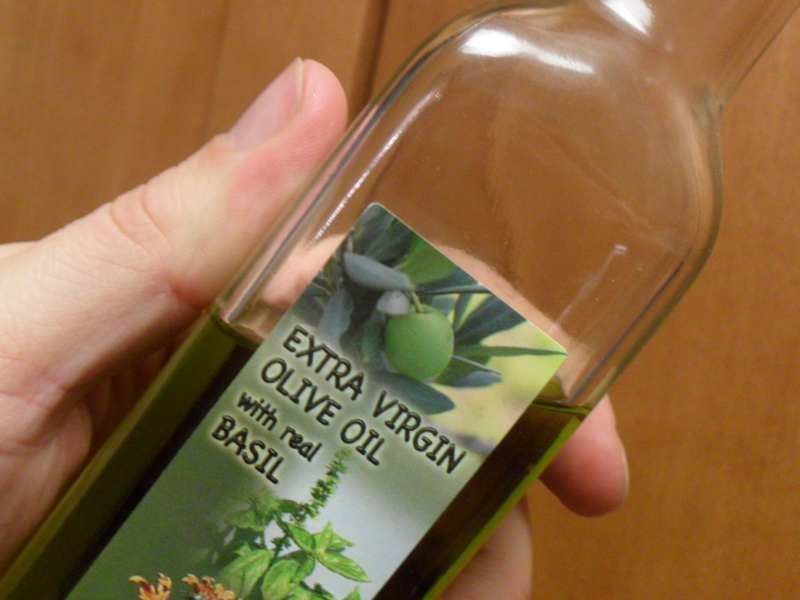 your kale chips sound great!..Im going to try my hand at them..oh by the way .. I looove your orange bowl!..where did you get it? Orange bowl was a recent find at Home Goods! I think it was, like, 10 bucks or under. I LOVE it! Fantastic, Melissa! Glad you enjoyed them, and glad you found the blog!! Welcome! Thanks for the kale chip recipe, David! I’ve been making “kale soup” for years, so it’s a well-known veggie in my family. It’s already on my shopping list for the next trip to the grocery store!